Being family-owned means that your business means a lot more to us! Plus, it gives us a chance to really pay attention to your needs as a customer. When you make a purchase from Pearls International, we actually remember who you are, and we’re happy to take the time to get to know a little bit about your tastes and style. Learn about how shopping at small businesses helps support communities! Our artisans are internationally acclaimed experts in their fields, and now you can own the beauty that our family has crafted for generations! Our exquisite jewelry is hand finished RIGHT HERE. Every single piece is meticulously inspected by our jeweler on-site before it is carefully hand-packed and personally shipped out to you. We’ll even call to make sure it arrived safely! 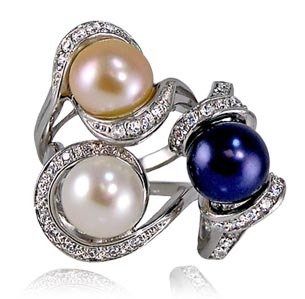 (Find out more about Jim the Jeweler and all of the Pearls International Pearl Girls here!) Our 100% Satisfaction Guarantee is only the first step! After all, you’re not going to tell everyone you know about us unless you’ve had an incredible experience, so that’s our goal. If you’re not totally satisfied with your pearls, we’ll work with you until it’s true love! Pearls aren’t the only thing we do! That’s right! Pearls are our favorite, but we also create custom designs. Need an engagement ring? An amazing anniversary gift? Repairs or resizing? We do it all. Contact Pearls International Customer Care for more information! We’re doing things differently around here every day, whether making changes to make us more environmentally sustainable, offering our employees new rewards and benefits to keep them happy and enthusiastic, or identifying exactly what you, as the customer are really looking for! Pearls International brings you the most beautiful Freshwater and Saltwater, Akoya, South-Sea, and Tahitian pearls you can find. Our experts seek out only the most precious and individual gems from around the world to provide to our favorite people: our Customers! Because each oyster has its own idea of what it wants to create, every single pearl we sell is utterly unique, just like you! With Pearls International in Daytona Beach Shores, you can be assured that your lovely piece of hand-crafted jewelry is as individual and elegant as you are! For classic beauty, check out these pearl necklaces. If you’re looking for something a little more non- traditional, why not try a pair of funky pearl earrings? When you’re in the mood for sweet and subtle, you’ll never go wrong with a striking pearl bracelet, and if bold is your favorite flavor, you’ll love these statement necklaces! Of course, if you’re a die-hard bargain shopper, be sure to check out our Fabulous Finds Under $50! Looking for gifts? You’ve come to the right place! We’d bet your friends don’t have a pearl cell phone charm, a pearl bookmark, or a pearl eyeglass chain, and we’re pretty darn certain the fanciest lap dog you know doesn’t own a pearl pet collar! Why not try something different this year and get them a truly one-of-a-kind gift from Pearls International? Whatever your taste and signature style, Pearls International has what you need for every occasion, so what are you waiting for? Looking for jewelry repair in Daytona Beach? Click here!